Paths contain geometry. Paths may be empty, or contain one or more Verbs that outline a figure. Path always starts with a move verb to a Cartesian_Coordinate, and may be followed by additional verbs that add lines or curves. Adding a close verb makes the geometry into a continuous loop, a closed contour. Paths may contain any number of contours, each beginning with a move verb. Path contours may contain only a move verb, or may also contain lines, Quadratic_Beziers, Conics, and Cubic_Beziers. Path contours may be open or closed. When used to draw a filled area, Path describes whether the fill is inside or outside the geometry. Path also describes the winding rule used to fill overlapping contours. Internally, Path lazily computes metrics likes bounds and convexity. Call SkPath::updateBoundsCache to make Path thread safe. Verb instructs Path how to interpret one or more Point and optional Conic_Weight; manage Contour, and terminate Path. SkPath::kMove_Verb 0 Consecutive kMove_Verb are preserved but all but the last kMove_Verb is ignored. kMove_Verb after other Verbs implicitly closes the previous Contour if SkPaint::kFill_Style is set when drawn; otherwise, stroke is drawn open. kMove_Verb as the last Verb is preserved but ignored. SkPath::kLine_Verb 1 Line is a straight segment from Point to Point. Consecutive kLine_Verb extend Contour. kLine_Verb at same position as prior kMove_Verb is preserved, and draws Point if SkPaint::kStroke_Style is set, and SkPaint::Cap is SkPaint::kSquare_Cap or SkPaint::kRound_Cap. kLine_Verb at same position as prior line or curve Verb is preserved but is ignored. SkPath::kQuad_Verb 2 Adds Quad from Last_Point, using control Point, and end Point. Quad is a parabolic section within tangents from Last_Point to control Point, and control Point to end Point. SkPath::kConic_Verb 3 Adds Conic from Last_Point, using control Point, end Point, and Conic_Weight. Conic is a elliptical, parabolic, or hyperbolic section within tangents from Last_Point to control Point, and control Point to end Point, constrained by Conic_Weight. Conic_Weight less than one is elliptical; equal to one is parabolic (and identical to Quad); greater than one hyperbolic. SkPath::kCubic_Verb 4 Adds Cubic from Last_Point, using two control Points, and end Point. Cubic is a third-order Bezier_Curve section within tangents from Last_Point to first control Point, and from second control Point to end Point. SkPath::kClose_Verb 5 Closes Contour, connecting Last_Point to kMove_Verb Point. Consecutive kClose_Verb are preserved but only first has an effect. kClose_Verb after kMove_Verb has no effect. SkPath::kDone_Verb 6 Not in Verb_Array, but returned by Path iterator. Each Verb has zero or more Points stored in Path. Path iterator returns complete curve descriptions, duplicating shared Points for consecutive entries. Direction describes whether Contour is clockwise or counterclockwise. When Path contains multiple overlapping Contours, Direction together with Fill_Type determines whether overlaps are filled or form holes. Direction also determines how Contour is measured. For instance, dashing measures along Path to determine where to start and stop stroke; Direction will change dashed results as it steps clockwise or counterclockwise. Closed Contours like Rect, Round_Rect, Circle, and Oval added with kCW_Direction travel clockwise; the same added with kCCW_Direction travel counterclockwise. Constructs an empty SkPath. By default, SkPath has no verbs, no SkPoint, and no weights. SkPath::FillType is set to kWinding_FillType. Constructs a copy of an existing path. Copy constructor makes two paths identical by value. Internally, path and the returned result share pointer values. The underlying verb array, SkPoint array and weights are copied when modified. Creating a SkPath copy is very efficient and never allocates memory. SkPath are always copied by value from the interface; the underlying shared pointers are not exposed. Modifying one path does not effect another, even if they started as copies of each other. Releases ownership of any shared data and deletes data if SkPath is sole owner. delete calls Path destructor, but copy of original in path2 is unaffected. Constructs a copy of an existing path. SkPath assignment makes two paths identical by value. Internally, assignment shares pointer values. The underlying verb array, SkPoint array and weights are copied when modified. Copying SkPath by assignment is very efficient and never allocates memory. SkPath are always copied by value from the interface; the underlying shared pointers are not exposed. Compares a and b; returns true if SkPath::FillType, verb array, SkPoint array, and weights are equivalent. rewind() removes Verb_Array but leaves storage; since storage is not compared, Path pair are equivalent. Compares a and b; returns true if SkPath::FillType, verb array, SkPoint array, and weights are not equivalent. Path pair are equal though their convexity is not equal. Returns true if SkPath contain equal verbs and equal weights. If SkPath contain one or more conics, the weights must match. conicTo() may add different verbs depending on conic weight, so it is not trivial to interpolate a pair of SkPath containing conics with different conic weight values. Interpolates between Paths with Point_Array of equal size. Copy Verb_Array and Weights to out, and set out Point_Array to a weighted average of this Point_Array and ending Point_Array, using the formula: (Path Point * weight) + ending Point * (1 - weight). weight is most useful when between zero (ending Point_Array) and one (this Point_Array); will work with values outside of this range. interpolate() returns false and leaves out unchanged if Point_Array is not the same size as ending Point_Array. Call isInterpolatable to check Path compatibility prior to calling interpolate(). Fill_Type selects the rule used to fill Path. Path set to kWinding_FillType fills if the sum of Contour edges is not zero, where clockwise edges add one, and counterclockwise edges subtract one. Path set to kEvenOdd_FillType fills if the number of Contour edges is odd. Each Fill_Type has an inverse variant that reverses the rule: kInverseWinding_FillType fills where the sum of Contour edges is zero; kInverseEvenOdd_FillType fills where the number of Contour edges is even. The top row has two clockwise rectangles. The second row has one clockwise and one counterclockwise rectangle. The even-odd variants draw the same. The winding variants draw the top rectangle overlap, which has a winding of 2, the same as the outer parts of the top rectangles, which have a winding of 1. Returns FillType, the rule used to fill SkPath. FillType of a new SkPath is kWinding_FillType. Sets FillType, the rule used to fill SkPath. While there is no check that ft is legal, values outside of FillType are not supported. If empty Path is set to inverse FillType, it fills all pixels. Returns if FillType describes area outside SkPath geometry. The inverse fill area extends indefinitely. Replaces FillType with its inverse. The inverse of FillType describes the area unmodified by the original FillType. Path drawn normally and through its inverse touches every pixel once. Path is convex if it contains one Contour and Contour loops no more than 360 degrees, and Contour angles all have same Direction. Convex Path may have better performance and require fewer resources on GPU_Surface. Path is concave when either at least one Direction change is clockwise and another is counterclockwise, or the sum of the changes in Direction is not 360 degrees. Initially Path Convexity is kUnknown_Convexity. Path Convexity is computed if needed by destination Surface. Computes SkPath::Convexity if required, and returns stored value. SkPath::Convexity is computed if stored value is kUnknown_Convexity, or if SkPath has been altered since SkPath::Convexity was computed or set. Returns last computed SkPath::Convexity, or kUnknown_Convexity if SkPath has been altered since SkPath::Convexity was computed or set. Convexity is unknown unless getConvexity is called without a subsequent call that alters the path. Stores convexity so that it is later returned by getConvexity() or getConvexityOrUnknown(). convexity may differ from getConvexity(), although setting an incorrect value may cause incorrect or inefficient drawing. If convexity is kUnknown_Convexity: getConvexity() will compute SkPath::Convexity, and getConvexityOrUnknown() will return kUnknown_Convexity. If convexity is kConvex_Convexity or kConcave_Convexity, getConvexity() and getConvexityOrUnknown() will return convexity until the path is altered. Computes SkPath::Convexity if required, and returns true if value is kConvex_Convexity. If setConvexity() was called with kConvex_Convexity or kConcave_Convexity, and the path has not been altered, SkPath::Convexity is not recomputed. Concave shape is erroneously considered convex after a forced call to setConvexity. Returns true if this path is recognized as an oval or circle. bounds receives bounds of oval. bounds is unmodified if oval is not found. Returns true if path is representable as SkRRect. Returns false if path is representable as oval, circle, or SkRect. rrect receives bounds of SkRRect. rrect is unmodified if SkRRect is not found. Draw rounded rectangle and its bounds. Sets SkPath to its initial state. Removes verb array, SkPoint array, and weights, and sets FillType to kWinding_FillType. Internal storage associated with SkPath is released. Sets SkPath to its initial state, preserving internal storage. Removes verb array, SkPoint array, and weights, and sets FillType to kWinding_FillType. Internal storage associated with SkPath is retained. Use rewind() instead of reset() if SkPath storage will be reused and performance is critical. Although path1 retains its internal storage, it is indistinguishable from a newly initialized path. Returns if SkPath is empty. Empty SkPath may have FillType but has no SkPoint, SkPath::Verb, or conic weight. SkPath() constructs empty SkPath; reset() and rewind() make SkPath empty. Returns if contour is closed. Contour is closed if SkPath SkPath::Verb array was last modified by close(). When stroked, closed contour draws SkPaint::Join instead of SkPaint::Cap at first and last SkPoint. close() has no effect if Path is empty; isLastContourClosed() returns false until Path has geometry followed by close(). Returns true for finite SkPoint array values between negative SK_ScalarMax and positive SK_ScalarMax. Returns false for any SkPoint array value of SK_ScalarInfinity, SK_ScalarNegativeInfinity, or SK_ScalarNaN. Returns true if the path is volatile; it will not be altered or discarded by the caller after it is drawn. SkPath by default have volatile set false, allowing SkSurface to attach a cache of data which speeds repeated drawing. 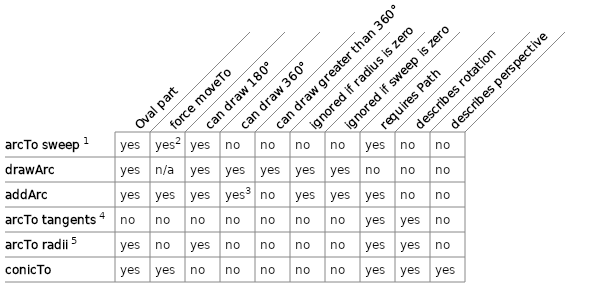 If true, SkSurface may not speed repeated drawing. Specifies whether SkPath is volatile; whether it will be altered or discarded by the caller after it is drawn. SkPath by default have volatile set false, allowing SkBaseDevice to attach a cache of data which speeds repeated drawing. Mark temporary paths, discarded or modified after use, as volatile to inform SkBaseDevice that the path need not be cached. Mark animating SkPath volatile to improve performance. Mark unchanging SkPath non-volatile to improve repeated rendering. raster surface SkPath draws are affected by volatile for some shadows. GPU surface SkPath draws are affected by volatile for some shadows and concave geometries. Tests if line between SkPoint pair is degenerate. Line with no length or that moves a very short distance is degenerate; it is treated as a point. exact changes the equality test. If true, returns true only if p1 equals p2. If false, returns true if p1 equals or nearly equals p2. As single precision floats, 100 and 100.000001 have the same bit representation, and are exactly equal. 100 and 100.0001 have different bit representations, and are not exactly equal, but are nearly equal. Tests if quad is degenerate. Quad with no length or that moves a very short distance is degenerate; it is treated as a point. As single precision floats: 100, 100.00001, and 100.00002 have different bit representations but nearly the same value. Translating all three by 1000 gives them the same bit representation; the fractional portion of the number can not be represented by the float and is lost. Tests if cubic is degenerate. Cubic with no length or that moves a very short distance is degenerate; it is treated as a point. Returns true if SkPath contains only one line; SkPath::Verb array has two entries: kMove_Verb, kLine_Verb. If SkPath contains one line and line is not nullptr, line is set to line start point and line end point. Returns false if SkPath is not one line; line is unaltered. Point_Array contains Points satisfying the allocated Points for each Verb in Verb_Array. For instance, Path containing one Contour with Line and Quad is described by Verb_Array: kMove_Verb, kLine_Verb, kQuad_Verb; and one Point for move, one Point for Line, two Points for Quad; totaling four Points. Point_Array may be read directly from Path with getPoints, or inspected with getPoint, with Iter, or with RawIter. Returns number of points in SkPath. Up to max points are copied. points may be nullptr; then, max must be zero. If max is greater than number of points, excess points storage is unaltered. Returns the number of points in SkPath. SkPoint count is initially zero. Returns SkPoint at index in SkPoint array. Valid range for index is 0 to countPoints() - 1. Returns (0, 0) if index is out of range. Verb_Array always starts with kMove_Verb. If kClose_Verb is not the last entry, it is always followed by kMove_Verb; the quantity of kMove_Verb equals the Contour count. Verb_Array does not include or count kDone_Verb; it is a convenience returned when iterating through Verb_Array. Verb_Array may be read directly from Path with getVerbs, or inspected with Iter, or with RawIter. Returns the number of verbs: kMove_Verb, kLine_Verb, kQuad_Verb, kConic_Verb, kCubic_Verb, and kClose_Verb; added to SkPath. Returns the number of verbs in the path. Up to max verbs are copied. The verbs are copied as one byte per verb. Exchanges the verb array, SkPoint array, weights, and SkPath::FillType with other. Cached state is also exchanged. swap() internally exchanges pointers, so it is lightweight and does not allocate memory. swap() usage has largely been replaced by operator=(const SkPath& path). SkPath do not copy their content on assignment until they are written to, making assignment as efficient as swap(). Returns minimum and maximum axes values of SkPoint array. Returns (0, 0, 0, 0) if SkPath contains no points. Returned bounds width and height may be larger or smaller than area affected when SkPath is drawn. SkRect returned includes all SkPoint added to SkPath, including SkPoint associated with kMove_Verb that define empty contours. Bounds of upright Circle can be predicted from center and radius. Bounds of rotated Circle includes control Points outside of filled area. Updates internal bounds so that subsequent calls to getBounds() are instantaneous. Unaltered copies of SkPath may also access cached bounds through getBounds(). For now, identical to calling getBounds() and ignoring the returned value. Call to prepare SkPath subsequently drawn from multiple threads, to avoid a race condition where each draw separately computes the bounds. Returns minimum and maximum axes values of the lines and curves in SkPath. Returns (0, 0, 0, 0) if SkPath contains no points. Returned bounds width and height may be larger or smaller than area affected when SkPath is drawn. Includes SkPoint associated with kMove_Verb that define empty contours. Behaves identically to getBounds() when SkPath contains only lines. If SkPath contains curves, computed bounds includes the maximum extent of the quad, conic, or cubic; is slower than getBounds(); and unlike getBounds(), does not cache the result. Returns true if rect is contained by SkPath. May return false when rect is contained by SkPath. For now, only returns true if SkPath has one contour and is convex. rect may share points and edges with SkPath and be contained. Returns true if rect is empty, that is, it has zero width or height; and the SkPoint or line described by rect is contained by SkPath. Rect is drawn in blue if it is contained by red Path. Grows SkPath verb array and SkPoint array to contain extraPtCount additional SkPoint. May improve performance and use less memory by reducing the number and size of allocations when creating SkPath. Shrinks SkPath verb array and SkPoint array storage to discard unused capacity. May reduce the heap overhead for SkPath known to be fully constructed. Adds beginning of contour at SkPoint (x, y). Adds beginning of contour at SkPoint p.
Adds beginning of contour relative to last point. If SkPath is empty, starts contour at (dx, dy). Otherwise, start contour at last point offset by (dx, dy). Function name stands for “relative move to”. Adds line from last point to (x, y). If SkPath is empty, or last SkPath::Verb is kClose_Verb, last point is set to (0, 0) before adding line. lineTo() appends kMove_Verb to verb array and (0, 0) to SkPoint array, if needed. lineTo() then appends kLine_Verb to verb array and (x, y) to SkPoint array. Adds line from last point to SkPoint p. If SkPath is empty, or last SkPath::Verb is kClose_Verb, last point is set to (0, 0) before adding line. lineTo() first appends kMove_Verb to verb array and (0, 0) to SkPoint array, if needed. lineTo() then appends kLine_Verb to verb array and SkPoint p to SkPoint array. Adds line from last point to vector (dx, dy). If SkPath is empty, or last SkPath::Verb is kClose_Verb, last point is set to (0, 0) before adding line. Appends kMove_Verb to verb array and (0, 0) to SkPoint array, if needed; then appends kLine_Verb to verb array and line end to SkPoint array. Line end is last point plus vector (dx, dy). Function name stands for “relative line to”. Quad describes a Quadratic_Bezier, a second-order curve identical to a section of a parabola. Quad begins at a start Point, curves towards a control Point, and then curves to an end Point. Quad is a special case of Conic where Conic_Weight is set to one. Quad is always contained by the triangle connecting its three Points. Quad begins tangent to the line between start Point and control Point, and ends tangent to the line between control Point and end Point. Adds quad from last point towards (x1, y1), to (x2, y2). If SkPath is empty, or last SkPath::Verb is kClose_Verb, last point is set to (0, 0) before adding quad. Appends kMove_Verb to verb array and (0, 0) to SkPoint array, if needed; then appends kQuad_Verb to verb array; and (x1, y1), (x2, y2) to SkPoint array. Adds quad from last point towards SkPoint p1, to SkPoint p2. If SkPath is empty, or last SkPath::Verb is kClose_Verb, last point is set to (0, 0) before adding quad. Appends kMove_Verb to verb array and (0, 0) to SkPoint array, if needed; then appends kQuad_Verb to verb array; and SkPoint p1, p2 to SkPoint array. Adds quad from last point towards vector (dx1, dy1), to vector (dx2, dy2). If SkPath is empty, or last SkPath::Verb is kClose_Verb, last point is set to (0, 0) before adding quad. Appends kMove_Verb to verb array and (0, 0) to SkPoint array, if needed; then appends kQuad_Verb to verb array; and appends quad control and quad end to SkPoint array. Quad control is last point plus vector (dx1, dy1). Quad end is last point plus vector (dx2, dy2). Function name stands for “relative quad to”. Conic describes a conical section: a piece of an ellipse, or a piece of a parabola, or a piece of a hyperbola. Conic begins at a start Point, curves towards a control Point, and then curves to an end Point. The influence of the control Point is determined by Conic_Weight. Each Conic in Path adds two Points and one Conic_Weight. Conic_Weights in Path may be inspected with Iter, or with RawIter. Weight determines both the strength of the control Point and the type of Conic. Weight varies from zero to infinity. At zero, Weight causes the control Point to have no effect; Conic is identical to a line segment from start Point to end point. If Weight is less than one, Conic follows an elliptical arc. If Weight is exactly one, then Conic is identical to Quad; Conic follows a parabolic arc. If Weight is greater than one, Conic follows a hyperbolic arc. If Weight is infinity, Conic is identical to two line segments, connecting start Point to control Point, and control Point to end Point. When Conic_Weight is one, Quad is added to path; the two are identical. If weight is less than one, Conic is an elliptical segment. A 90 degree circular arc has the weight 1 / sqrt(2). If weight is greater than one, Conic is a hyperbolic segment. As weight gets large, a hyperbolic segment can be approximated by straight lines connecting the control Point with the end Points. Adds conic from last point towards (x1, y1), to (x2, y2), weighted by w. If SkPath is empty, or last SkPath::Verb is kClose_Verb, last point is set to (0, 0) before adding conic. Appends kMove_Verb to verb array and (0, 0) to SkPoint array, if needed. If w is finite and not one, appends kConic_Verb to verb array; and (x1, y1), (x2, y2) to SkPoint array; and w to conic weights. If w is one, appends kQuad_Verb to verb array, and (x1, y1), (x2, y2) to SkPoint array. If w is not finite, appends kLine_Verb twice to verb array, and (x1, y1), (x2, y2) to SkPoint array. As weight increases, curve is pulled towards control point. The bottom two curves are elliptical; the next is parabolic; the top curve is hyperbolic. Adds conic from last point towards SkPoint p1, to SkPoint p2, weighted by w. If SkPath is empty, or last SkPath::Verb is kClose_Verb, last point is set to (0, 0) before adding conic. If w is finite and not one, appends kConic_Verb to verb array; and SkPoint p1, p2 to SkPoint array; and w to conic weights. If w is one, appends kQuad_Verb to verb array, and SkPoint p1, p2 to SkPoint array. If w is not finite, appends kLine_Verb twice to verb array, and SkPoint p1, p2 to SkPoint array. Conics and arcs use identical representations. As the arc sweep increases the Conic_Weight also increases, but remains smaller than one. Adds conic from last point towards vector (dx1, dy1), to vector (dx2, dy2), weighted by w. If SkPath is empty, or last SkPath::Verb is kClose_Verb, last point is set to (0, 0) before adding conic. If w is finite and not one, next appends kConic_Verb to verb array, and w is recorded as conic weight; otherwise, if w is one, appends kQuad_Verb to verb array; or if w is not finite, appends kLine_Verb twice to verb array. In all cases appends SkPoint control and end to SkPoint array. control is last point plus vector (dx1, dy1). end is last point plus vector (dx2, dy2). Function name stands for “relative conic to”. Cubic describes a Bezier_Curve segment described by a third-order polynomial. Cubic begins at a start Point, curving towards the first control Point; and curves from the end Point towards the second control Point. Adds cubic from last point towards (x1, y1), then towards (x2, y2), ending at (x3, y3). If SkPath is empty, or last SkPath::Verb is kClose_Verb, last point is set to (0, 0) before adding cubic. Appends kMove_Verb to verb array and (0, 0) to SkPoint array, if needed; then appends kCubic_Verb to verb array; and (x1, y1), (x2, y2), (x3, y3) to SkPoint array. Adds cubic from last point towards SkPoint p1, then towards SkPoint p2, ending at SkPoint p3. If SkPath is empty, or last SkPath::Verb is kClose_Verb, last point is set to (0, 0) before adding cubic. Appends kMove_Verb to verb array and (0, 0) to SkPoint array, if needed; then appends kCubic_Verb to verb array; and SkPoint p1, p2, p3 to SkPoint array. Adds cubic from last point towards vector (dx1, dy1), then towards vector (dx2, dy2), to vector (dx3, dy3). If SkPath is empty, or last SkPath::Verb is kClose_Verb, last point is set to (0, 0) before adding cubic. Appends kMove_Verb to verb array and (0, 0) to SkPoint array, if needed; then appends kCubic_Verb to verb array; and appends cubic control and cubic end to SkPoint array. Cubic control is last point plus vector (dx1, dy1). Cubic end is last point plus vector (dx2, dy2). Function name stands for “relative cubic to”. Arc can be constructed in a number of ways. Arc may be described by part of Oval and angles, by start point and end point, and by radius and tangent lines. Each construction has advantages, and some constructions correspond to Arc drawing in graphics standards. All Arc draws are implemented by one or more Conic draws. When Conic_Weight is less than one, Conic describes an Arc of some Oval or Circle. CirclearcTo(const SkRect& oval, SkScalar startAngle, SkScalar sweepAngle, bool forceMoveTo) describes Arc as a piece of Oval, beginning at start angle, sweeping clockwise or counterclockwise, which may continue Contour or start a new one. This construction is similar to PostScript and HTML_Canvas arcs. Variation addArc always starts new Contour. SkCanvas::drawArc draws without requiring Path. PatharcTo(SkScalar x1, SkScalar y1, SkScalar x2, SkScalar y2, SkScalar radius) describes Arc as tangent to the line segment from last Point added to Path to (x1, y1); and tangent to the line segment from (x1, y1) to (x2, y2). This construction is similar to PostScript and HTML_Canvas arcs. arcsarcTo(SkScalar rx, SkScalar ry, SkScalar xAxisRotate, ArcSize largeArc, Direction sweep, SkScalar x, SkScalar y) describes Arc as part of Oval with radii (rx, ry), beginning at last Point added to Path and ending at (x, y). More than one Arc satisfies this criteria, so additional values choose a single solution. This construction is similar to SVG arcs. conicTo describes Arc of less than 180 degrees as a pair of tangent lines and Conic_Weight. conicTo can represent any Arc with a sweep less than 180 degrees at any rotation. All arcTo constructions are converted to Conic data when added to Path. 1 describes an arc from an oval, a starting angle, and a sweep angle. 2 is similar to 1, but does not require building a path to draw. 3 is similar to 1, but always begins new Contour. 4 describes an arc from a pair of tangent lines and a radius. 5 describes an arc from Oval center, arc start Point and arc end Point. 6 describes an arc from a pair of tangent lines and a Conic_Weight. Appends arc to SkPath. Arc added is part of ellipse bounded by oval, from startAngle through sweepAngle. Both startAngle and sweepAngle are measured in degrees, where zero degrees is aligned with the positive x-axis, and positive sweeps extends arc clockwise. arcTo() adds line connecting SkPath last SkPoint to initial arc SkPoint if forceMoveTo is false and SkPath is not empty. Otherwise, added contour begins with first point of arc. Angles greater than -360 and less than 360 are treated modulo 360.
arcTo continues a previous contour when forceMoveTo is false and when Path is not empty. Appends arc to SkPath, after appending line if needed. Arc is implemented by conic weighted to describe part of circle. Arc is contained by tangent from last SkPath point to (x1, y1), and tangent from (x1, y1) to (x2, y2). Arc is part of circle sized to radius, positioned so it touches both tangent lines. If last Path Point does not start Arc, arcTo appends connecting Line to Path. The length of Vector from (x1, y1) to (x2, y2) does not affect Arc. Arc sweep is always less than 180 degrees. If radius is zero, or if tangents are nearly parallel, arcTo appends Line from last Path Point to (x1, y1). arcTo appends at most one Line and one conic. arcTo implements the functionality of PostScript arct and HTML Canvas arcTo. arcTo is represented by Line and circular Conic in Path. Appends arc to SkPath, after appending line if needed. Arc is implemented by conic weighted to describe part of circle. Arc is contained by tangent from last SkPath point to p1, and tangent from p1 to p2. Arc is part of circle sized to radius, positioned so it touches both tangent lines. If last SkPath SkPoint does not start arc, arcTo() appends connecting line to SkPath. The length of vector from p1 to p2 does not affect arc. Arc sweep is always less than 180 degrees. If radius is zero, or if tangents are nearly parallel, arcTo() appends line from last SkPath SkPoint to p1. arcTo() appends at most one line and one conic. arcTo() implements the functionality of PostScript arct and HTML Canvas arcTo. Because tangent lines are parallel, arcTo appends line from last Path Point to p1, but does not append a circular Conic. Four axis-aligned Ovals with the same height and width intersect a pair of Points. ArcSize and Direction select one of the four Ovals, by choosing the larger or smaller arc between the Points; and by choosing the arc Direction, clockwise or counterclockwise. Arc begins at top of Oval pair and ends at bottom. Arc can take four routes to get there. Two routes are large, and two routes are counterclockwise. The one route both large and counterclockwise is blue. Appends arc to SkPath. Arc is implemented by one or more conics weighted to describe part of oval with radii (rx, ry) rotated by xAxisRotate degrees. Arc curves from last SkPath SkPoint to (x, y), choosing one of four possible routes: clockwise or counterclockwise, and smaller or larger. Arc sweep is always less than 360 degrees. arcTo() appends line to (x, y) if either radii are zero, or if last SkPath SkPoint equals (x, y). arcTo() scales radii (rx, ry) to fit last SkPath SkPoint and (x, y) if both are greater than zero but too small. arcTo() appends up to four conic curves. arcTo() implements the functionality of SVG arc, although SVG sweep-flag value is opposite the integer value of sweep; SVG sweep-flag uses 1 for clockwise, while kCW_Direction cast to int is zero. Appends arc to SkPath. Arc is implemented by one or more conic weighted to describe part of oval with radii (r.fX, r.fY) rotated by xAxisRotate degrees. Arc curves from last SkPath SkPoint to (xy.fX, xy.fY), choosing one of four possible routes: clockwise or counterclockwise, and smaller or larger. Arc sweep is always less than 360 degrees. arcTo() appends line to xy if either radii are zero, or if last SkPath SkPoint equals (xy.fX, xy.fY). arcTo() scales radii r to fit last SkPath SkPoint and xy if both are greater than zero but too small to describe an arc. Appends Arc to Path, relative to last Path Point. Arc is implemented by one or more Conic, weighted to describe part of Oval with radii (rx, ry) rotated by xAxisRotate degrees. Arc curves from last Path Point to relative end Point (dx, dy), choosing one of four possible routes: clockwise or counterclockwise, and smaller or larger. If Path is empty, the start Arc Point is (0, 0). Arc sweep is always less than 360 degrees. arcTo appends Line to end Point if either radii are zero, or if last Path Point equals end Point. arcTo scales radii (rx, ry) to fit last Path Point and end Point if both are greater than zero but too small to describe an arc. arcTo appends up to four Conic curves. arcTo implements the functionality of SVG_Arc, although SVG “sweep-flag” value is opposite the integer value of sweep; SVG “sweep-flag” uses 1 for clockwise, while kCW_Direction cast to int is zero. Appends kClose_Verb to SkPath. A closed contour connects the first and last SkPoint with line, forming a continuous loop. Open and closed contour draw the same with SkPaint::kFill_Style. With SkPaint::kStroke_Style, open contour draws SkPaint::Cap at contour start and end; closed contour draws SkPaint::Join at contour start and end. close() has no effect if SkPath is empty or last SkPath SkPath::Verb is kClose_Verb. Returns true if fill is inverted and Path with fill represents area outside of its geometric bounds. Returns equivalent Fill_Type representing Path fill inside its bounds. Approximates Conic with Quad array. Conic is constructed from start Point p0, control Point p1, end Point p2, and weight w. Quad array is stored in pts; this storage is supplied by caller. Maximum Quad count is 2 to the pow2. Every third point in array shares last Point of previous Quad and first Point of next Quad. Maximum pts storage size is given by: (1 + 2 * (1 << pow2)) * sizeof(SkPoint). Returns Quad count used the approximation, which may be smaller than the number requested. Conic_Weight determines the amount of influence Conic control point has on the curve. w less than one represents an elliptical section. w greater than one represents a hyperbolic section. w equal to one represents a parabolic section. Two Quad curves are sufficient to approximate an elliptical Conic with a sweep of up to 90 degrees; in this case, set pow2 to one. A pair of Quad curves are drawn in red on top of the elliptical Conic curve in black. The middle curve is nearly circular. The top-right curve is parabolic, which can be drawn exactly with a single Quad. Returns true if SkPath is equivalent to SkRect when filled. If false: rect, isClosed, and direction are unchanged. If true: rect, isClosed, and direction are written to if not nullptr. rect may be smaller than the SkPath bounds. SkPath bounds may include kMove_Verb points that do not alter the area drawn by the returned rect. After addRect, isRect returns true. Following moveTo permits isRect to return true, but following lineTo does not. addPoly returns true even though rect is not closed, and one side of rect is made up of consecutive line segments. Returns true if SkPath is equivalent to nested SkRect pair when filled. If false, rect and dirs are unchanged. If true, rect and dirs are written to if not nullptr: setting rect to outer SkRect, and rect to inner SkRect; setting dirs to SkPath::Direction of outer SkRect, and dirs to SkPath::Direction of inner SkRect. Adds SkRect to SkPath, appending kMove_Verb, three kLine_Verb, and kClose_Verb, starting with top-left corner of SkRect; followed by top-right, bottom-right, and bottom-left if dir is kCW_Direction; or followed by bottom-left, bottom-right, and top-right if dir is kCCW_Direction. The left Rect dashes starting at the top-left corner, to the right. The right Rect dashes starting at the top-left corner, towards the bottom. Adds Rect to Path, appending kMove_Verb, three kLine_Verb, and kClose_Verb. If dir is kCW_Direction, Rect corners are added clockwise; if dir is kCCW_Direction, Rect corners are added counterclockwise. start determines the first corner added. The arrow is just after the initial corner and points towards the next corner appended to Path. Adds SkRect (left, top, right, bottom) to SkPath, appending kMove_Verb, three kLine_Verb, and kClose_Verb, starting with top-left corner of SkRect; followed by top-right, bottom-right, and bottom-left if dir is kCW_Direction; or followed by bottom-left, bottom-right, and top-right if dir is kCCW_Direction. The left Rect dashes start at the top-left corner, and continue to the right. The right Rect dashes start at the top-left corner, and continue down. Adds oval to path, appending kMove_Verb, four kConic_Verb, and kClose_Verb. Oval is upright ellipse bounded by SkRect oval with radii equal to half oval width and half oval height. Oval begins at (oval.fRight, oval.centerY()) and continues clockwise if dir is kCW_Direction, counterclockwise if dir is kCCW_Direction. Adds Oval to Path, appending kMove_Verb, four kConic_Verb, and kClose_Verb. Oval is upright ellipse bounded by Rect oval with radii equal to half oval width and half oval height. Oval begins at start and continues clockwise if dir is kCW_Direction, counterclockwise if dir is kCCW_Direction. Adds Circle centered at (x, y) of size radius to Path, appending kMove_Verb, four kConic_Verb, and kClose_Verb. Circle begins at: (x + radius, y), continuing clockwise if dir is kCW_Direction, and counterclockwise if dir is kCCW_Direction. Has no effect if radius is zero or negative. Appends arc to SkPath, as the start of new contour. Arc added is part of ellipse bounded by oval, from startAngle through sweepAngle. Both startAngle and sweepAngle are measured in degrees, where zero degrees is aligned with the positive x-axis, and positive sweeps extends arc clockwise. If sweepAngle <= -360, or sweepAngle >= 360; and startAngle modulo 90 is nearly zero, append oval instead of arc. Otherwise, sweepAngle values are treated modulo 360, and arc may or may not draw depending on numeric rounding. The middle row of the left and right columns draw differently from the entries above and below because sweepAngle is outside of the range of +/-360, and startAngle modulo 90 is not zero. Appends SkRRect to SkPath, creating a new closed contour. SkRRect has bounds equal to rect; each corner is 90 degrees of an ellipse with radii (rx, ry). If dir is kCW_Direction, SkRRect starts at top-left of the lower-left corner and winds clockwise. If dir is kCCW_Direction, SkRRect starts at the bottom-left of the upper-left corner and winds counterclockwise. If either rx or ry is too large, rx and ry are scaled uniformly until the corners fit. If rx or ry is less than or equal to zero, addRoundRect() appends SkRect rect to SkPath. After appending, SkPath may be empty, or may contain: SkRect, oval, or SkRRect. If either radius is zero, path contains Rect and is drawn red. If sides are only radii, path contains Oval and is drawn blue. All remaining path draws are convex, and are drawn in gray; no paths constructed from addRoundRect are concave, so none are drawn in green. Appends Round_Rect to Path, creating a new closed Contour. Round_Rect has bounds equal to rect; each corner is 90 degrees of an ellipse with radii from the array. If dir is kCW_Direction, Round_Rect starts at top-left of the lower-left corner and winds clockwise. If dir is kCCW_Direction, Round_Rect starts at the bottom-left of the upper-left corner and winds counterclockwise. If both radii on any side of rect exceed its length, all radii are scaled uniformly until the corners fit. If either radius of a corner is less than or equal to zero, both are treated as zero. After appending, Path may be empty, or may contain: Rect, Oval, or Round_Rect. Adds rrect to SkPath, creating a new closed contour. If dir is kCW_Direction, rrect starts at top-left of the lower-left corner and winds clockwise. If dir is kCCW_Direction, rrect starts at the bottom-left of the upper-left corner and winds counterclockwise. Adds rrect to Path, creating a new closed Contour. If dir is kCW_Direction, rrect winds clockwise; if dir is kCCW_Direction, rrect winds counterclockwise. start determines the first point of rrect to add. Adds contour created from line array, adding (count - 1) line segments. Contour added starts at pts, then adds a line for every additional SkPoint in pts array. If close is true, appends kClose_Verb to SkPath, connecting pts[count - 1] and pts. If count is zero, append kMove_Verb to path. Has no effect if count is less than one. Adds contour created from list. Contour added starts at list, then adds a line for every additional SkPoint in list. If close is true, appends kClose_Verb to SkPath, connecting last and first SkPoint in list. If list is empty, append kMove_Verb to path. AddPathMode chooses how addPath appends. Adding one Path to another can extend the last Contour or start a new Contour. SkPath::kAppend_AddPathMode #Line # appended to destination unaltered ## Path Verbs, Points, and Conic_Weights are appended to destination unaltered. Since Path Verb_Array begins with kMove_Verb if src is not empty, this starts a new Contour. SkPath::kExtend_AddPathMode #Line # add line if prior Contour is not closed ## If destination is closed or empty, start a new Contour. If destination is not empty, add Line from Last_Point to added Path first Point. Skip added Path initial kMove_Verb, then append remaining Verbs, Points, and Conic_Weights. test is built from path, open on the top row, and closed on the bottom row. The left column uses kAppend_AddPathMode; the right uses kExtend_AddPathMode. The top right composition is made up of one contour; the other three have two. Appends src to SkPath, offset by (dx, dy). If mode is kAppend_AddPathMode, src verb array, SkPoint array, and conic weights are added unaltered. If mode is kExtend_AddPathMode, add line before appending verbs, SkPoint, and conic weights. Appends src to SkPath, transformed by matrix. Transformed curves may have different verbs, SkPoint, and conic weights. Appends src to SkPath, from back to front. Reversed src always appends a new contour to SkPath. Offsets SkPoint array by (dx, dy). Offset SkPath replaces dst. If dst is nullptr, SkPath is replaced by offset data. Offsets SkPoint array by (dx, dy). SkPath is replaced by offset data. Transforms verb array, SkPoint array, and weight by matrix. transform may change verbs and increase their number. Transformed SkPath replaces dst; if dst is nullptr, original data is replaced. Transforms verb array, SkPoint array, and weight by matrix. transform may change verbs and increase their number. SkPath is replaced by transformed data. Path is defined cumulatively, often by adding a segment to the end of last Contour. Last_Point of Contour is shared as first Point of added Line or Curve. Last_Point can be read and written directly with getLastPt and setLastPt. Returns last point on SkPath in lastPt. Returns false if SkPoint array is empty, storing (0, 0) if lastPt is not nullptr. Sets last point to (x, y). If SkPoint array is empty, append kMove_Verb to verb array and append (x, y) to SkPoint array. Sets the last point on the path. If SkPoint array is empty, append kMove_Verb to verb array and append p to SkPoint array. SegmentMask constants correspond to each drawing Verb type in Path; for instance, if Path only contains Lines, only the kLine_SegmentMask bit is set. SkPath::kLine_SegmentMask 1 Set if Verb_Array contains kLine_Verb. SkPath::kQuad_SegmentMask 2 Set if Verb_Array contains kQuad_Verb. Note that conicTo may add a Quad. SkPath::kConic_SegmentMask 4 Set if Verb_Array contains kConic_Verb. SkPath::kCubic_SegmentMask 8 Set if Verb_Array contains kCubic_Verb. When conicTo has a weight of one, Quad is added to Path. Returns a mask, where each set bit corresponds to a SegmentMask constant if SkPath contains one or more verbs of that type. Returns zero if SkPath contains no lines, or curves: quads, conics, or cubics. getSegmentMasks() returns a cached result; it is very fast. Returns true if the point (x, y) is contained by Path, taking into account FillType. kWinding_FillType a non-zero sum of Contour Directions. kEvenOdd_FillType an odd number of Contours. kInverseWinding_FillType a zero sum of Contour Directions. kInverseEvenOdd_FillType and even number of Contours. Writes text representation of SkPath to stream. If stream is nullptr, writes to standard output. Set forceClose to true to get edges used to fill SkPath. Set dumpAsHex true to generate exact binary representations of floating point numbers used in SkPoint array and conic weights. Writes text representation of SkPath to standard output. The representation may be directly compiled as C++ code. Floating point values are written with limited precision; it may not be possible to reconstruct original SkPath from output. Writes text representation of Path to standard output. The representation may be directly compiled as C++ code. Floating point values are written in hexadecimal to preserve their exact bit pattern. The output reconstructs the original Path. Use instead of dump() when submitting bug reports against Skia . Writes SkPath to buffer, returning the number of bytes written. Pass nullptr to obtain the storage size. Writes SkPath::FillType, verb array, SkPoint array, conic weight, and additionally writes computed information like SkPath::Convexity and bounds. Use only be used in concert with readFromMemory(); the format used for SkPath in memory is not guaranteed. Writes SkPath to buffer, returning the buffer written to, wrapped in SkData. serialize() writes SkPath::FillType, verb array, SkPoint array, conic weight, and additionally writes computed information like SkPath::Convexity and bounds. serialize() should only be used in concert with readFromMemory(). The format used for SkPath in memory is not guaranteed. Initializes SkPath from buffer of size length. Returns zero if the buffer is data is inconsistent, or the length is too small. Reads SkPath::FillType, verb array, SkPoint array, conic weight, and additionally reads computed information like SkPath::Convexity and bounds. Used only in concert with writeToMemory(); the format used for SkPath in memory is not guaranteed. Generation_ID provides a quick way to check if Verb_Array, Point_Array, or Conic_Weight has changed. Generation_ID is not a hash; identical Paths will not necessarily have matching Generation_IDs. Empty Paths have a Generation_ID of one. (See Skia bug 1762.) Returns a non-zero, globally unique value. A different value is returned if verb array, SkPoint array, or conic weight changes. Setting SkPath::FillType does not change generation identifier. Each time the path is modified, a different generation identifier will be returned. SkPath::FillType does affect generation identifier on Android framework. Returns if SkPath data is consistent. Corrupt SkPath data is detected if internal values are out of range or internal storage does not match array dimensions. Iterates through Verb_Array, and associated Point_Array and Conic_Weight. Provides options to treat open Contours as closed, and to ignore degenerate data. Ignoring the actual Verbs and replacing them with Quads rounds the path of the glyph. Initializes SkPath::Iter with an empty SkPath. next() on SkPath::Iter returns kDone_Verb. Call setPath to initialize SkPath::Iter at a later time. Sets SkPath::Iter to return elements of verb array, SkPoint array, and conic weight in path. If forceClose is true, SkPath::Iter will add kLine_Verb and kClose_Verb after each open contour. path is not altered. Returns next SkPath::Verb in verb array, and advances SkPath::Iter. When verb array is exhausted, returns kDone_Verb. Zero to four SkPoint are stored in pts, depending on the returned SkPath::Verb. If doConsumeDegenerates is true, skip consecutive kMove_Verb entries, returning only the last in the series; and skip very small lines, quads, and conics; and skip kClose_Verb following kMove_Verb. if doConsumeDegenerates is true and exact is true, only skip lines, quads, and conics with zero lengths. skip degenerate skips the first in a kMove_Verb pair, the kMove_Verb followed by the kClose_Verb, the zero length Line and the very small Line. skip degenerate if exact skips the same as skip degenerate, but shows the very small Line. skip none shows all of the Verbs and Points in Path. Returns conic weight if next() returned kConic_Verb. If next() has not been called, or next() did not return kConic_Verb, result is undefined. Returns true if last kLine_Verb returned by next() was generated by kClose_Verb. When true, the end point returned by next() is also the start point of contour. If next() has not been called, or next() did not return kLine_Verb, result is undefined. Returns true if subsequent calls to next() return kClose_Verb before returning kMove_Verb. if true, contour SkPath::Iter is processing may end with kClose_Verb, or SkPath::Iter may have been initialized with force close set to true. Iterates through Verb_Array, and associated Point_Array and Conic_Weight. Verb_Array, Point_Array, and Conic_Weight are returned unaltered. Initializes RawIter with an empty SkPath. next() on RawIter returns kDone_Verb. Call setPath to initialize SkPath::Iter at a later time. Sets RawIter to return elements of verb array, SkPoint array, and conic weight in path. Sets SkPath::Iter to return elements of verb array, SkPoint array, and conic weight in path. Returns next SkPath::Verb in verb array, and advances RawIter. When verb array is exhausted, returns kDone_Verb. Zero to four SkPoint are stored in pts, depending on the returned SkPath::Verb. Returns next SkPath::Verb, but does not advance RawIter.